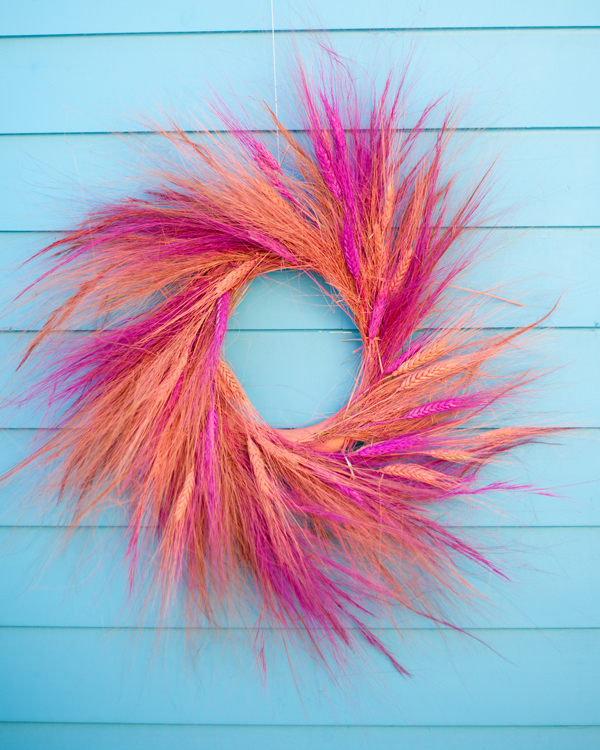 This fall we are warming up our mantel with a bright, festive wreath made with color dyed wheat. It’s a little bit fraggle rock, a little bit country, loads of fun, and a festive way to welcome guests into our home. The process of bright color dying allows this wheat to work great for welcoming in trick-or-treaters and Thanksgiving feasters alike. 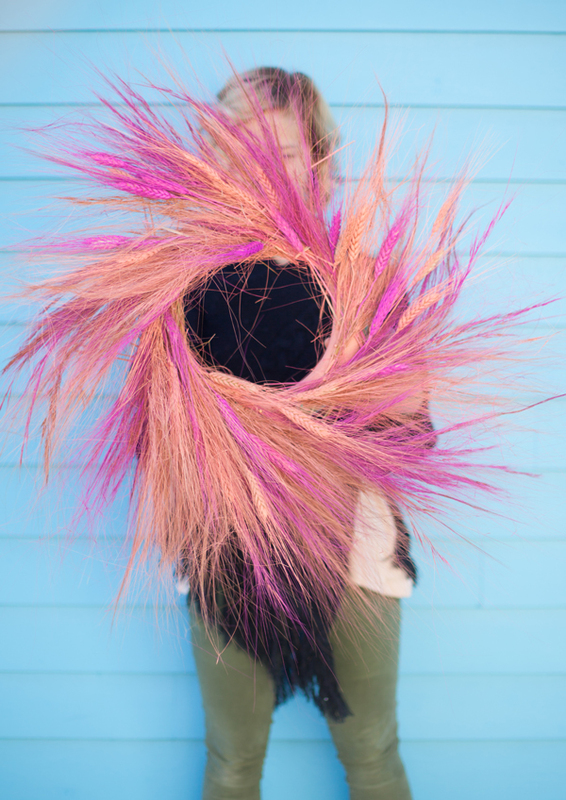 One fun project that will brighten up any space all season long. 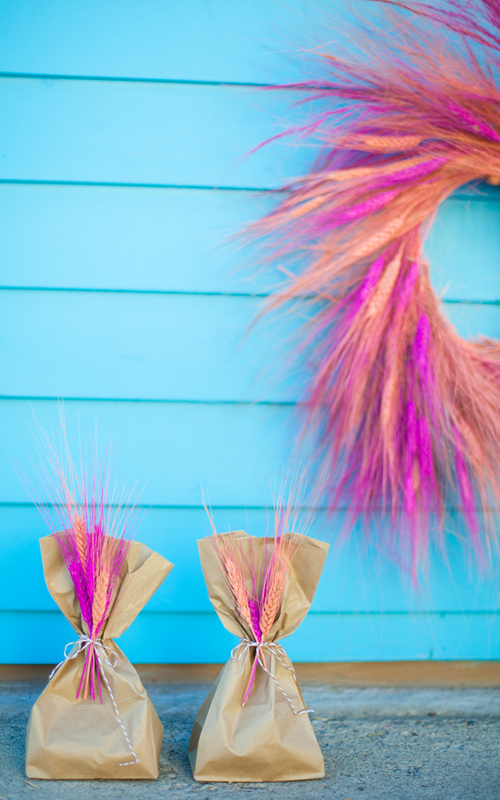 In straight form, the color dyed wheat makes for a sweet way to finish off favor packages and doggy bags, leaving guests with my favorite bright look of fall. 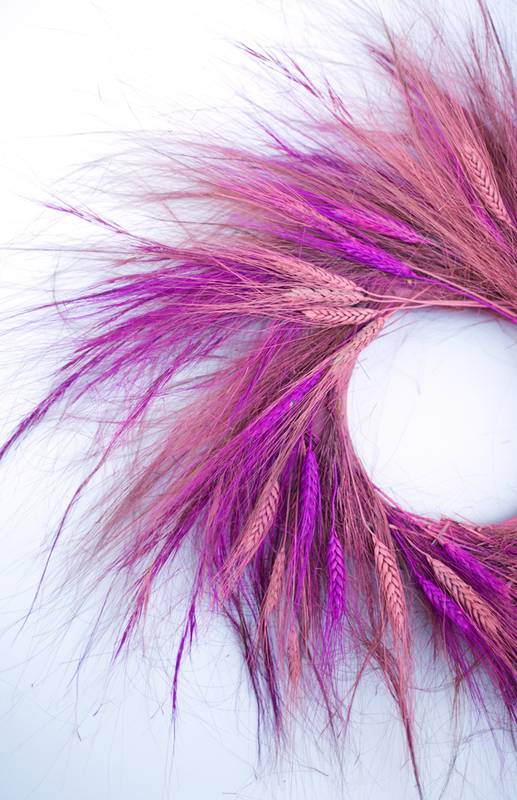 To make the wreath you’ll need: wheat, a wreath form, pushpins, small clear rubber bands, and paint for dying the wheat. We tried a couple different dying techniques before finding the right way to get this festive, vibrant color. Fabric dye has a hard time holding to the wheat, and paint dying got a little too clumpy to use. 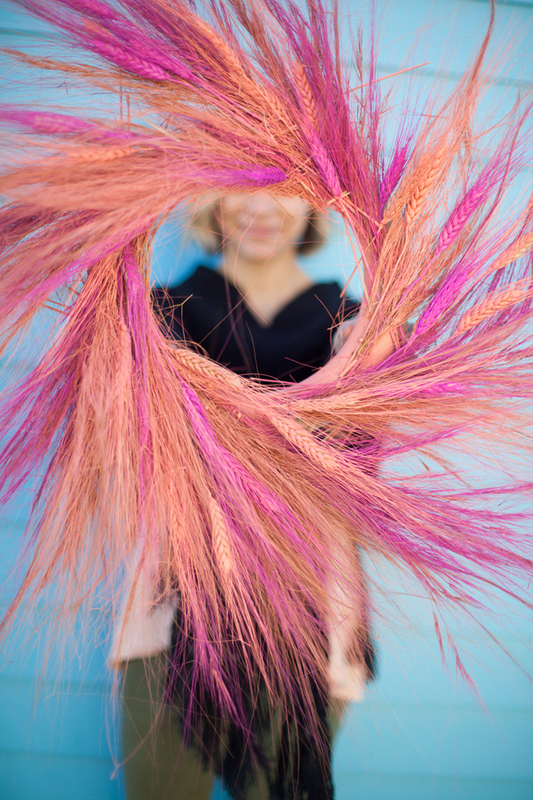 The best way to color dye the wheat is by spraying the color directly onto it. Set the wheat out on an painting canvas and using bright colors (like these) spray directly onto the wheat. Wait for the wheat to fully dry and turn to coat the other side. You will also want to paint your wreath frame to match the color of the wheat for the most graphic display. 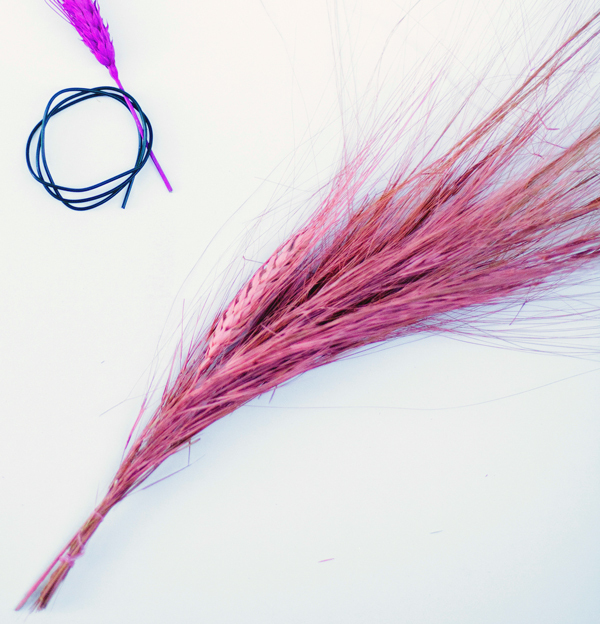 Once the wheat has been colored, clip off any left over ends that might have missed the dye stage. 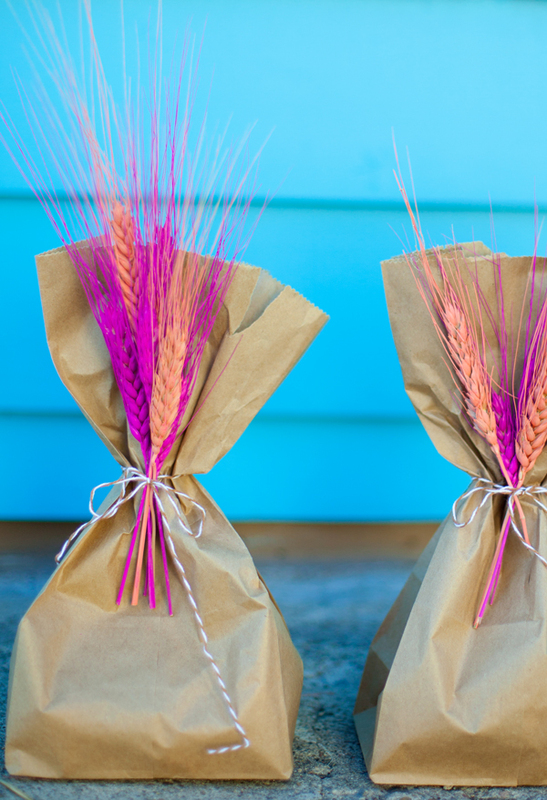 Pull a small wheat bunch together and tie around baggies for bright fall favors, and the cutest doggy bags ever! To make the wreath, take bunches of the wheat and rubber band together with small clear bands. The rubber bands work better than floral tape for this project because they won’t show through the texture of the wheat and they are able to hold even the fringing small pieces together. For this wreath we combined about 15 of these bunches in two different colors. Once the bunches are combined, begin pinning them around the wreath frame. The straight pins should poke directly through the bottom bunch of the wheat. You’ll be pinning the wheat at about a 45 degree angle to the wreath frame, to provide adequate coverage of the frame, but also leave enough room for the fun and wild look of it hanging off the frame. For added stability we used small dabs of glue to hold the wheat in place where we wanted it. Make your house-mantel-headboard-wall-door-whatever welcoming this fall. 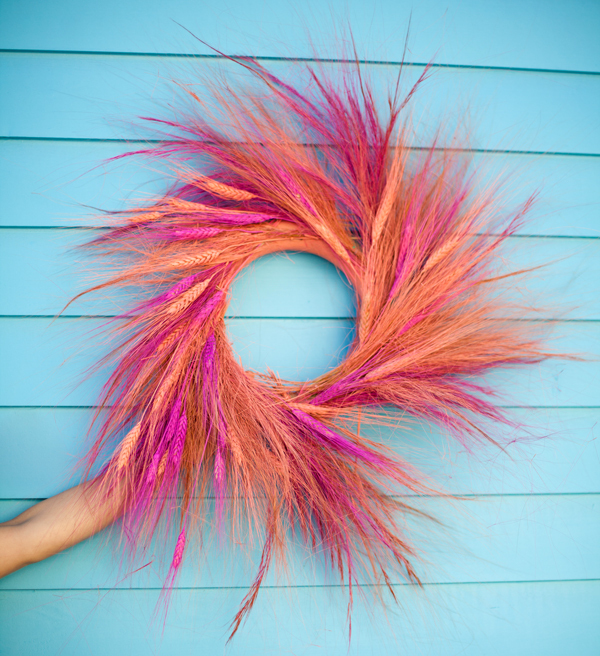 The wreath looks amazing any place you hang it and it brings that added funky detail you need to make it merry. 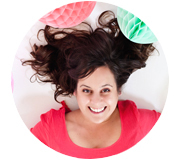 (Photography by Jocelyn Noel for A Subtle Revelry). OK, I’ve been dying to make a cute wreath for my front door, and I’m absolutely in love with this one, plus, they are selling wheat at the farmers market, totally making this this weekend! oooh… I love this! We need more pink wreaths in the Fall! So sweet! That link takes me to Michael’s homepage- what kind of paint did you spray in.. plain ol’ spraypaint? Cant wait to try it out! Colleen, Hi! The brand we used was a Kraft neon coloring from Micheals. Hope that helps. 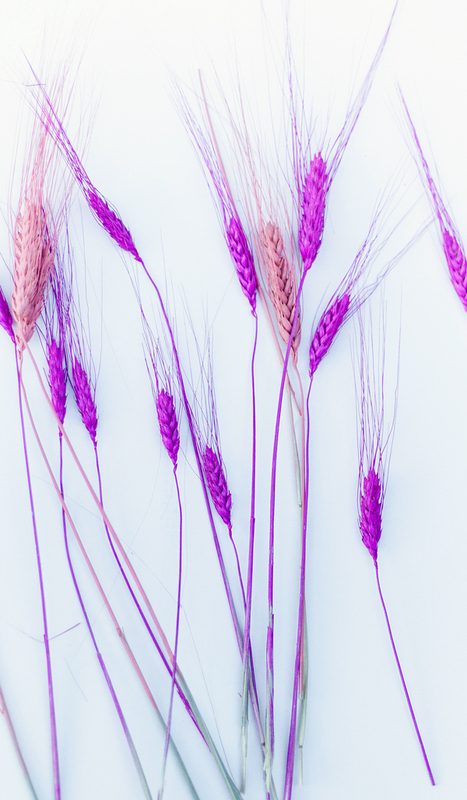 What brand of paint was used to dye the wheat?